No photos, but a funny story. Anyway, one of the topics that has been buzzing around the design community in recent years is the whole length of patterns issue. Designers want to go on at the length they feel they need to, publishers tend to want things as short as possible to conserve on ink and paper, and/or to leave more room for advertisements. Then someone always points out that there is always room for a how-to in many of these pubs, and wouldn't one assume that if someone was buying something for an intermediate knitter they would know the difference between a knit and a purl? Can't we save some space there? Then someone always says that patterns are too over written these days anyway and maybe we should assume the knitter or crocheter can figure some stuff out on her or his own, and write shorter instructions. Not that there are any right answers here, these are just comments that seem to drift across my consciousness every quarter or so. So I am carefully leafing through the remains of a knitting book printed in 1847 and enjoying myself immensely. Did you know they used to say pearl stitch instead of purl stitch? I wonder when that changed? Anyway I wanted to share the following pattern with you, in its entirety. 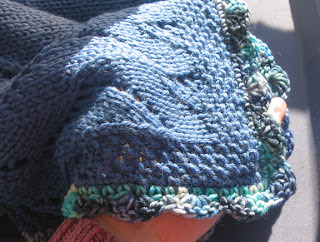 Eight stripes with one hundred and thirteen stitches for each, with a border of fifty stitches; a counterpane without a border will require more stripes. That's it - the whole pattern, right there. No gauge, no amount of materials, nada. Can't accuse a 19th century knitting book author of spoon-feeding her audience, can you? 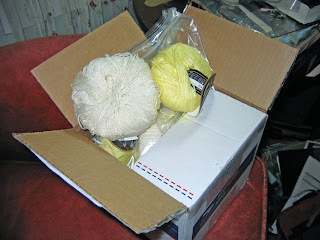 Then this lovely box of cream and yellow goodness arrived. It wants to be a top for a magazine when it grows up, and it wants to grow up FAST! So this is what I will be working on this week. You know, in between writing two books and two magazine articles that are also due soon. Monday being a school holiday in honor of Dr. Martin Luther King Jr., the Kid had a jones to go to to The Crayola Factory in Easton, PA. While I don't hate this place, I was thinking she might be a wee bit old for their target demographic and didn't really want to drive and hour and a half and pay $30 only to see her yawn with boredom. But her father agreed to drive, and I had a sleeve to finish (photos later in the week) and so we went. She actually still quite likes it - it is a whole floor of arts and crafts stuff to mess with, and what's bad about that? My favorite part is where you get to play with the air dry clay that they make. So of course all my little airdry clay thingies are knitting related, because what else do I think of? 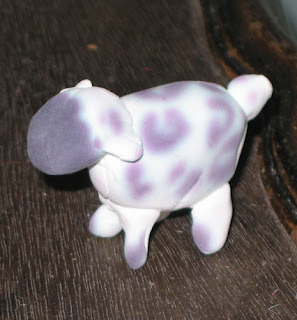 My favorite is this here sheep. While not a shining example of the sculptor's art, it was kind of fun to do :-) I should have put in a quarter or something for scale, he is about and inch and a half high. Then I made a ball of yarn with some knitting needles sticking out of it, then because I don't want to be accused of ignoring my brothers and sisters of the hook, I made a crochet hook as well. The Kid just rolled her eyes at me - she wasn't surprised at all! I had had to put the spinning wheel away in the weeks leading up to TNNA because I wanted to spin because I was stressed, but if I sat at the wheel all day nothing else would get done which would make me even more stressed. 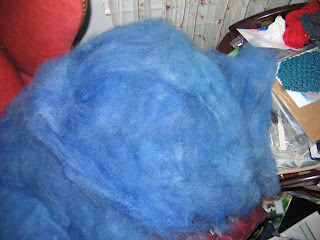 So over the weekend I dug out this batt I bought right before Christmas at Woolbearers in Mount Holly, NJ. It is a lovely lovely blue and I can't remember for the life of me what breed of sheep it is, although I know they told me. Romney perhaps? Anyway, this is my first experiment with something other than merino top. My thickness is okay, I like how it handles (and the lanolin on my hands! ), but the singles are a little fuzzier than I expected. The Kid has had great success spinning this as well so we are going to have a yarn co-production - we will each spin some singles and then ply the two together. Ah the joys of mother/daughter projects. Dance has started up again for her - oh boy... Which means tons of sample making for me in the waiting room of the dance school. We both had a nice breather after regionals though, and she is getting her grades up a bit which makes me very proud. We have a rule that she has to work as hard on her homework as at her dance, but honestly when you were eleven, which would you rather do? Off to play with my new design software. I am still very early in the learning curve - will give you all a full review when I start to get the hang of things. TNNA is The National NeedleArts Association, a trade show where manufacturers display their new wares so LYSs can purchase them wholesale, and designers like me wander around, drool and pet, and ponder the design possibilities of the new merch. It happens twice a year, in January on the west coast, and in June in the midwest. 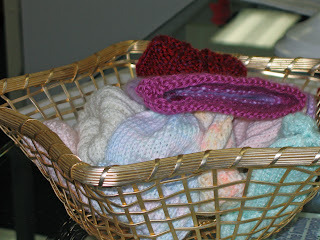 So off I went last week to do some PR for The Secret Language of Knitters and to do some legal fondling. While it is a trade show rather than a retail show, which means you can't really buy stuff on the show floor, there is a hoobie on Thursday called Sample It! in which some of the wholesalers bring some goodies to sell outright. 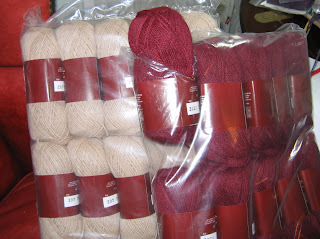 I always try not to get carried away, but this time two yarns followed me home, and what could I say? 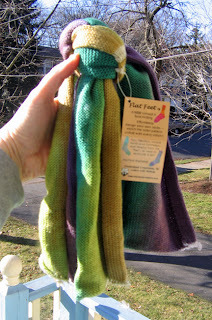 This is Flat Feet from Conjoined Creations I could not get over how clever this yarn is - it is a hand dyed yarn that is sold in flats rather than skeins - you just pull off the waste yarn, grab the real stuff, and knit from the flat, which unravels as you go. No knots, no skeins to wind, and because it is hand dyed each flat gives a unique pair of socks. The flat is divided in the middle so that if you want a long sock you can go toe up and knit until you run out without having to split a skein. It came in oodles of colors - I bought this one for a friend to try since my sock yarn stash is ridiculous, but I couldn't stand not to buy one. I am sure she will give me a review. On Saturday I taped a segment of Knit and Crochet Today! a newish show seen on various PBS stations. I hear that several new markets will be picking up the show when the new episodes are released in the fall of 2008, so if you don't get it yet, you might soon. Anyway I was hanging out in the waiting area with Kaffe Fassett, and tried really hard not to act like a stalker. He has some new yarns coming out which will make your brain melt in delight at the color ranges. I am pretty sure that I did not sound like a total idiot, which is always a relief. Then it was back to the market to schmooze and drool some more. I want to take a moment to thank all of you who stopped by to see me on Sunday at the book signing. I was having a real Sally Fields moment when I realized there were actually people waiting in line to get a copy! After that, some friends and I went off to Roscoe's Chicken and Waffles where I enjoyed the house specialty, chicken and waffles. It was delicious if a bit hard on the arteries - I ate half of the plate and stopped in self defense. 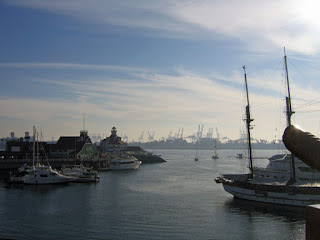 One of the things I liked about the Long Beach convention center is that if you walked outside, there was an actual view of something pretty. There were also several other restaurants in walking distance, and if I had been so inclined, a ferris wheel across the street! Happy to be home, trying to get back on the right time zone, and really trying to get through the mounds of notes I took about who to contact about what, when. 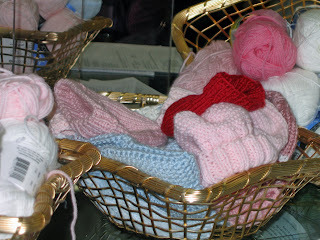 I spent Saturday with the fine folks at Creative Fibers in Windsor CT, where many many ladies and a few nice kids dropped by to make a dent in their goal of 250 preemie hats to five local hospital NICUs by Valentine's Day. And a good time was had by all! We knit, I read from the book, we kibbitzed, we knit some more, I signed some books, and the Kid and I of course had to do some shopping, because how can you go to a new to you yarn store and not shop? Whew! Every year I underestimate the time I will spend running up and down the New Jersey Turnpike (always an adventure), baking cookies, and just generally being busy. Which means I will be glued to my laptop 24/7 for the next week trying to catch up with my work schedule, but oh well. Holidays happen. As you can see, I got the Jurassic WIP finished in plenty of time, much to the delight of my mother. It looks pretty darn good if I do say so myself - living proof of the miracles of blocking. 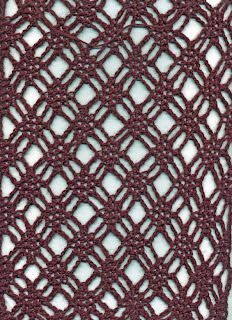 I whomped a little crocheted shell stitch border on there because I am old school (I will NOT say old!) and needed a border, even though every one at the LYS assured me that border-free was a very contemporary look for throws. I just couldn't stand it, so bought this lovely superwash multi for the border because I did not have enough of the original yarn left. I got a little gifty in the mail myself. Well, okay, strictly speaking it wasn't a gifty because I ordered it myself, but years of experience have taught me to make sure there at least one thing I really want under the tree so as to avoid the appearance of disappointment. So here is the first installation of a three month roving club I got from Flawful Fibers. I am using it as a carrot to inspire myself to get caught up with my work - although I am dying to start spinning it up now I really have to get another few chapters of the log home book edited and ready to ship off before I get any quality, guilt-free spinning time. 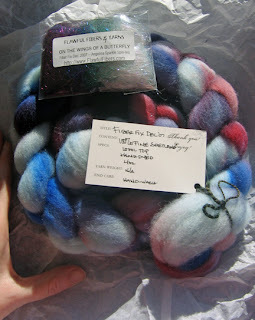 It is a fine shetland wool top - yum - and came with some little color-coordinated sparklies to spin with it! If you are in the Windsor CT area, stop by Creative Fibers this Saturday from noon to 4:00pm. I will be signing books and doing my usual shtick, and we are collecting preemie hats for local hospitals. The store has set an ambitious goal of 250 hats, and I am just not that fast a knitter when I am yakking, so stop by, have fun, and help us out. Next week TNNA - and man am I not ready to go! Did I mention this was going to be a busy week?